But Facebook refused to acknowledge that…. On Tuesday, Facebook became the subject of a Senate inquiry over claims of anti-conservative bias in its Trending section. Senate Commerce Committee Chairman John Thune, a South Dakota Republican, sent Mark Zuckerberg a letter asking a series of pointed questions about how Facebook chooses stories for the section, how it trains its news “curators,” who’s responsible for their decisions, and what steps it’s taking to investigate the bias claims. He also asks for detailed records of stories that the company decided not to include in the Trending section despite their popularity among Facebook users. The inquiry followed a report by Gizmodo’s Michael Nunez, in which anonymous former Facebook “curators” described the subjective process by which they assembled the Trending section. Facebook had publicly portrayed the section – which you can find near the top right on the Facebook website or under the search tab on the Facebook app – as an algorithmically driven reflection of the most popular stories its users are reading at any given time. But the ex-curators said they often filtered out stories that were deemed questionable and added others they deemed worthy [even if they were not trending]. One, a self-identified conservative, complained that this led to subtle yet pervasive liberal bias, since most of the curators were politically liberal themselves. Popular stories from conservative sites such as Breitbart, for instance, were allegedly omitted unless more mainstream publications such as the New York Times also picked them up. But you can’t begin to address the subjective nature of news without first acknowledging it. And Facebook has gone out of its way to avoid doing that, for reasons that are central to its identity as a technology company. For that matter, you don’t get that big by admitting that you’re a media company. As the New York Times’ John Herrman and Mike Isaac point out, 65 percent of Americans surveyed by Pew view the news media as a “negative influence on the country.” For technology companies, that number is just 17 percent. It’s very much in Facebook’s interest to remain a social network in the public’s eyes, even in the face of mounting evidence that it’s something much bigger than that. And it’s in Facebook’s interest to shift responsibility for controversial decisions from humans, whom we know to be biased, to algorithms, which we tend to lionize. …The algorithm that surfaces the stories might skirt questions of bias by simply ranking them in order of popularity, thus delegating responsibility for story selection from Facebook’s employees to its users. Even that – the notion that what’s popular is worth highlighting – represents a human value judgment, albeit one that’s not particularly vulnerable to accusations of political bias. (That’s why Twitter isn’t in the same hot water over its own simpler trending topics module.) …..
Facebook can and will dispute the specifics of these claims, as the company’s vice president of search, Tom Stocky, did in a Facebook post Tuesday morning. But they’re missing the point entirely. Facebook’s problem is not that its “curators” are biased. Facebook’s problem is that it refuses to admit that they’re biased. …..
1. What types of bias does the Gizmodo article expose about Facebook’s “trending news” section? Such allegations are especially disturbing given Facebook’s outsized role in news distribution. With 1.65 billion active monthly users as of May 1, its audience is enormous. A recent Pew study, looking at news consumption on smartphones, discovered that Facebook sends more readers to news sites than any other social-media platform. Facebook also has exceptional potential to influence the politics of millennials, a group that just surpassed baby boomers as America’s biggest generation. Sixty-one percent of adults under 34 consume political news from Facebook, according to Pew. Narrowing their exposure to diverse opinions and perspectives changes the way they view the world. 3. 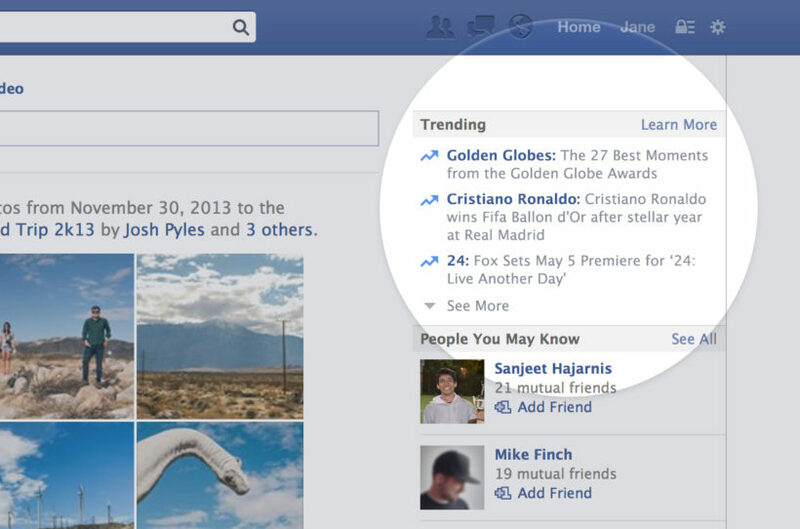 Would this information about Facebook affect your use of its “trending news” section? Explain your answer. 1. Facebook displays bias by omission, story selection and spin (claiming it uses computer algorithms to list the “trending” news stories).